"There is nobody like Axel." "Axel's yoga classes have provided immeasurable physical, mental and spiritual benefits to me and several of my friends and family members. Axel's classes are for anyone that is looking not only to learn about the science of yoga, but also how it can apply to their everyday lives. As the classes are very interactive, students get to hear how yoga applies to their specific life challenges and the life challenges of others in the class. The strength and wisdom of Axel's teachings are a reflection of his deep personal commitment to the study and practice of yoga. 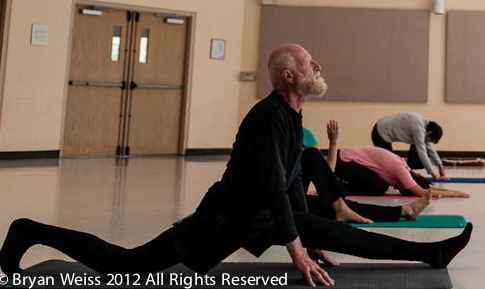 Axel has been a devoted student of yoga for over 44 years. Often in class, he draws upon his personal library of over 3,000 yogic and spiritual texts." "It is a privilege to be able to recommend Axel’s classes to anyone who may have the slightest interest in learning more about the science of yoga and how it can benefit you in areas of physical, emotional and spiritual growth. I have been a student of Axel’s for over 20 years. Axel’s wealth of knowledge coupled with his energy and unique teaching style continues to keep me motivated with my yoga practice. I know that it is through Axel’s teachings that I have been able to grow as an individual, wife, mother, daughter, sister and friend. The benefits have been and continue to be immeasurable and have positively influenced all areas of my life. Thank you, Axel, for every one of your classes over the decades…"
"To Axel, to thank you for helping me on my life journey. I appreciate the support you have given me for the past 21 years on every level: physical, spiritual and emotional. Your yogic lessons have opened my mind to see the world through a much wider lens. Your classes have kept me in excellent physical condition through the practise of Hatha Yoga." "I began praying for a spriritual teacher about a year ago. I am grateful for Axel's guidance to stretch and deepen my understanding of prana, karma and meditation and to foster a commitment to a spiritual discipline. The teachings of SRI SWAMI SIVANANDA illuminates and inspires our class work. May sweetness and blessing flow to this holy teacher and to all of his devotees. I have practiced and studied yoga since I was 18. Now that I am almost 50, yoga practice has evolved into a path of service, a desire for freedom and happiness for all living things. Ahimsa, non-harming (or striving to do the least harm) has begun an opening that I feel and understand as the heart of compassion blossoming like a thousand petaled lotus. It is good to have a truly gifted teacher on this path." "I started taking Axel's classes in 2008 and they have transformed my life in every way. I had been suffering from vertigo for 7 years. There were days when I could not walk, stand or do any work. After the first 2 months of classes and regular home practice (as per Axel's recommendations, including meditation and breathing exercises), I was completely free of vertigo symptoms. I was crying when I realize I could stand up straight with my eyes closed and not fall down. This was only the beginning. Yoga has become more than a hobby or weekly exercise for me, it is a way of life. I would recommend Axel's classes to anyone looking to improve their physical and mental health, seeking spritual advice, and everyday life wisdom." "I started attending Axel's classes after my second child was born and I cannot say enough about the physical and mental strength I have gained since working with Axel. I have no hesitation recommending his classes to those who want to grow physically and spiritually. Thank you Axel!" "Axel has been my yoga instructor for over 11 years. He has been teaching full-time for 44 years. Admittedly, when I first joined Axel's class I was focused on doing the postures. I was somewhat aware of his voice in the background but spent most of those earlier classes trying to get "it" right. Over time, I began to listen to Axel's lectures in class and relaxed into my practice. Each class brings a new lecture topic, and Axel's teachings resonate with me each week. Axel's lectures are thought-provoking and relevant. Axel gladly welcomes questions in class and suggestions for future lecture topics." "I have been a student of Axel for the last 7 years. Before signing up for Axel's classes, I heard that Yoga was beneficial for the body. Seven years later I can see how short sighted I was. Not only it is good for the body, it has positively impacted all aspects of my life. My fitness, vitality, energy levels, posture, concentration, work throughput, relationships and personal growth have all been taken to the next level. Axel's unique style of teaching opened a new dimension in Yoga for me. It propelled me to look deeper into myself and created an insatiable appetite for personal growth. Seven years later, I find myself introducing Yogic values to my two kids and preaching Yoga to my friends. I thank you Axel for opening my eyes." "For over 30 years, I had been a student of many spiritual disciplines and studied all the major world's religions. I was seeking answers to a plethora of questions - Who am I?, What is my purpose?, How can I and others go beyond just surviving life and make a positive impact? Axel's classes began as many of my other past seeking expeditions, but in a very short time, I knew it was different. Through Axel's guidance, I developed more spiritual, physical and emotional confidence that has ultimately helped me find answers to my questions. I could write a novel on all the benefits (big and small) I have received since starting Axel's classes, but I think the greatest achievement is knowing I am no longer a seeker – I am a sincere practitioner of the teachings." "I have been taking yoga with Axel for almost 20 years since I started attending his classes at University of Toronto. Axel has had enormous positive impact on all areas of my life. 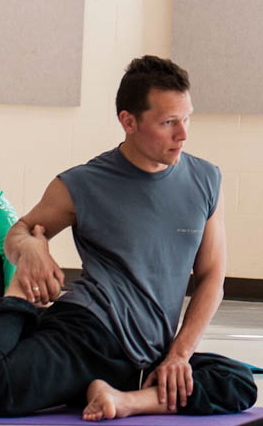 Heis undoubtedly the most experienced and knowledgeable yoga teacher in all of Toronto having taught for over 30 years. From a physical perspective, Axel's classes have improved my fitness, flexibility and strength. In addition, through Axel's influence, I quit smoking and have been a vegetarian for nearly 20 years." "I am a Psychologist in private practice in Toronto with more than 30 years of clinical experience. I began attending Axel’s classes and retreats approximately 12 years ago. Prior to taking up the practice of yoga, I played hockey and basketball weekly. I did not consider this exercise for fitness. The limited stretching that I did before games was solely intended to avoid injury. This was not generally successful. Muscle pulls and strains were common. At least once a year I would endure an episode of severe lower back spasms that would incapacitate me for days and would require medical treatment, including several prescription medications. Since beginning the practice of yoga with Axel’s direction, encouragement and support, the benefits have been more than obvious. I am more flexible and physically fit at 59 than I was at 29. I have not experienced a single episode of lower back pain. I am a better person spiritually, morally and ethically. I am a more effective Psychologist. Over the years, I have regularly referred clients to Axel’s classes. I am grateful to Axel for the undeniable benefits that his inspiring example, teachings, and the practice of yoga have brought to my life." "I first started studying yoga with Axel in 1973 when I was a graduate student at York University. I found the combination of hatha, prana yama, diet and meditation to provide the balance I needed for my studies in environment and my competitive sport of fencing. I work with industry, government, and the community, in local, regional, provincial, national and international settings. The yogic training – meditation and pranayama – helps me to engage effectively with the audience(s), while reaching out and sharing the philosophy and practices of sustainability applied and pollution prevention. Moreover, I’ve been able to adapt the yoga training to coach my work colleagues so that they too are effective in communicating in high stakes forums, workshops and teaching sessions. Forty years later, I can say with assurance that Axel has had a profound influence on my life. No higher testimonial can I give than that my two sisters, their spouses, and my wife have all been studying yoga with Axel over the years." "Axel has become an integral part of my everyday life. My progress has been slow and steady. He is my spiritual guru and I trust and value the the student-teacher relationship we share. One of the first lessons I learned from Axel is to get over your fear of asking questions in class. I have developed the courage to ask questions on pertinent topics about life. Axel provides a wonderful exercise class through the teaching of hath yoga, but more importantly his caring ways have taught me how to have a more spiritual approach to living. Thank you Axel." "When I moved to Toronto in 1976, I had on my agenda to find a yoga class. Several years before, a doctor had a suggested that I take up yoga, finding me in her office stressed and unhealthy. I did not have enough maturity at the time to follow up on her suggestion, but it never left my mind. In January 1977, I found Axel’s class. He was teaching in the archery room at the women’s gym at the university of Toronto. A strange setting, yet I knew right away that this was something special. After a few months, Axel told me able another class at Hart House at the university, so I joined this class and went to it over many years until it was no longer offered at that location. It has now been 35 years since I first found Axel’s yoga class. Over this time, I have had many experiences, some very difficult and others very inspiring. My children have been born and grown up, my parents have grown old and passed away, and I have been so fortunate to have been able to see many parts of the world and participate in unique events. Common to all these experiences are my reflections on the teaching that Axel has offered over the years. They have guided my decisions and helped keep my ego in check. There are no words to express my gratitude to that doctor that steered me towards Axel’s classes and for all the benefits that I have been fortunate to have received from Axel and his generous effort to guide us all in a positive direction." "Yoga has become very popular in North America and you don't have to go far to get a good workout and/or Yoga class. However, if you are interested in not just the postures but the philosophy and history of yoga, Axel's yoga style impacts not just the time in class but lifestyle. Axel has taught me that yoga is a commitment, a lifestyle and a discipline to follow and his dedication is enlightening." "I recently had major abdominal surgery. The surgeons were amazed at how well I withstood the 5 hour operation and how quickly I recovered. When they asked me how this could be, I attributed it to my yoga practice. Studying with Axel for 3 years has made me physically stronger, mentally more determined, and emotionally and spiritually more grounded. I found that I approached the surgery with confidence, optimism and hope. I am very grateful to Axel for his teachings, encouragement and support which have changed my life day to day as well as in times of crisis." "I began my journey into the world of Yoga, over 30 years ago when I was at York University. My wife and a friend practiced yoga and suggested I join them for a class on campus. It was the most important choice I have made in my life and has provided me a foundation with which to fall back on when I drift off centre. Axel was always able to bring a story, a piece of insight, a reference to a book or a teacher to the class and well inserted times of humour to "crack" you up in the middle of your "striving" to be perfect at the postures. My fondest memory was as he walked amongst us during a longer strength posture, when he suddenly informed us that what we put into our body is so important and gently commented that "if you eat a Big Mac, you will be a Big Mac". I don't know about others, but I know I almost fell out of my posture, but he just moved on and pulled our focus back and provided such an important message to a group of scattered brained university students who were squeezing this brief escape from the pressures of school and "not eating properly". My greatest thanks to Axel and I highly recommend anyone to give themselves a gift and join him for one, or as many sessions that you can go. He will always be there with you as you go forward." "Axel brings a groundedness and wisdom to his approach that are attributes rarely found among western teachers. His approach to teachings is both accessible as well as deeply entrneched in the core values of many spiritual approaches. Always clear in his views, he is accepting and open to the journeys of all in his classes. In addition to what we take away from his offerings is a great yoga class – perfect ordering of postures, enough variety to feel challenged, and thorough in the well roundedness of your practice. Many of us travel significant distances to attend his classes (and some have for an impressively large number of years) for a good reason – Axel is a fantastic lift for us all. I'll be in his class for as long as he is teaching. Namaste Axel! "I have taken yoga lessons with Axel for nearly 10 years. Through his influence it has been a continuous upwards spiral of learning, committing and doing in every aspect of my life. Little did I know where it would take me at the beginning: from conventional diet to vegetarian, to raw food, Axel raised my awareness in the development of my mind, spirit and soul. I learned to meditate and acquired a deep appreciation of spiritual and philosophical reading and thinking. Axel is a great teacher and mentor for me and all of us. Thanks to Axel, I have many new, dear and precious friends. All we need to do is open our mind and be receptive to learn and change. Thanks a million Axel, You are a keeper." Leave a testimonial for Axel! How have Axel's classes and the practice of yoga helped you? How many years have you taken classes with Axel? Our purpose in collecting student stories is not simply to make you aware of the benefits that students experience when they attend Axel's classes. We also want to describe the benefits of yoga practice. One of the common themes in the stories above is that students take their yoga practice beyond the physical postures. They find wisdom and inspiration in the yoga practices and teachings that promote mental, emotional and spiritual growth. We are pleased to add student stories that describe benefits of yoga practice to improve work performance, clarity of mind and recovery from illness. Please note that sending us your story serves as consent for us to post your story on our website. We reserve the right to edit.